It is 126 pages long. 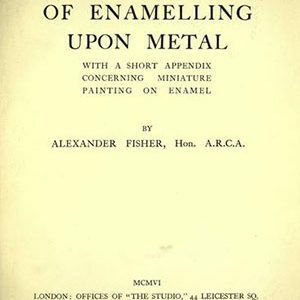 Chapters include: Equipment, materials, problems, escutheons and hinges, drawer and door pulls and hinges, finger plates, pad corners, box corners, stamp box and match box, sconce, picture frame, soldering, repousse or embossing, raised forms, porringer, trays or plates, ink pot, sealing wax and watch fobs, spoons, sugar tongs, tea scoops, rivets, drawing wire, tubing, polishing, stamping work, coloring, enameling. The many projects detailed are used to introduce most of the core skills of the goldsmith and silversmith, and how to use the tools. 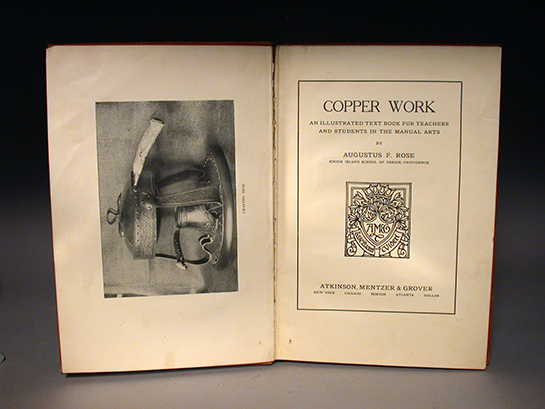 The book is filled with projects for teaching metal work and shaping. 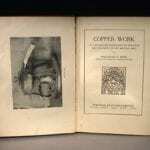 There are many excellent photographs, diagrams and engravings. 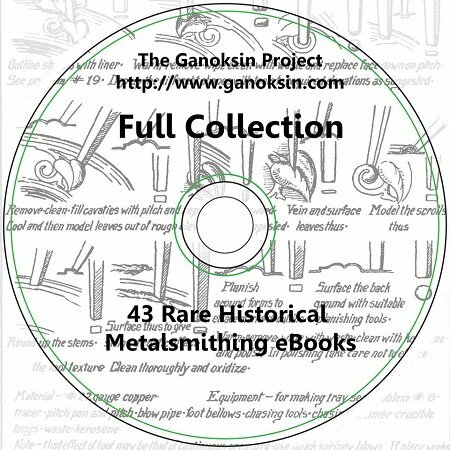 The hammers and stakes shown are the core ones for a silversmith to know about, with great annotative descriptions. Chasing tools and more are dealt with very well. The many drawings of all these tools are clear and excellent. There are dozens of examples of project designs. Many items are hardware parts and are definitely art nouveau designs, some with a Scottish Rennie Machintosh feeling to them. It is interesting what household objects have fallen out of favor today. Fingerplates to protect your door, corners for your blotting pad to blot your quill pen on, box corners, candle holders, ink pots for the desk, sealing wax sets, watch fobs and other odd metal parts for your home are detailed and diagramed. One can of course use the designs and ideas shown to create new types of objects, say, cell phone covers. There are extensive discussions on hinge principles and design. Box making is covered. Soldering is well described as is riveting. So is raising a vessel, in detail, with interesting images, including using the tang (the upright support on a stake) as a forming surface. 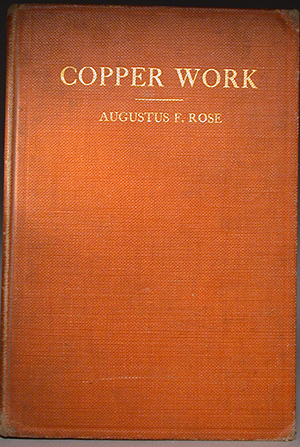 The information seems a little self invented (rather than, say, consulting Tiffany’s silversmithing apprentices) but is still solid, and not found elsewhere. 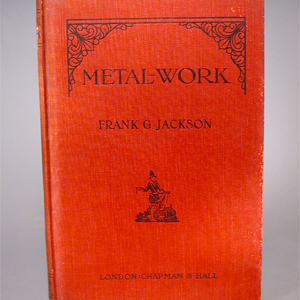 Very thorough in fact and definitely great for anyone into raising, silversmithing and larger metalwork. Snarling iron use is detailed, more than in any other book. There is an excellent section on spoons. A very good chapter on making and drawing tubing. And riveting. 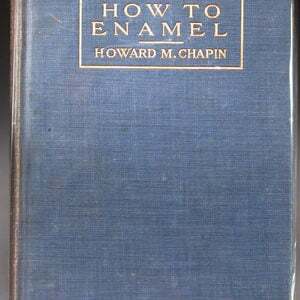 There is a good introduction to basic enameling. Again, a recommended book for your library.